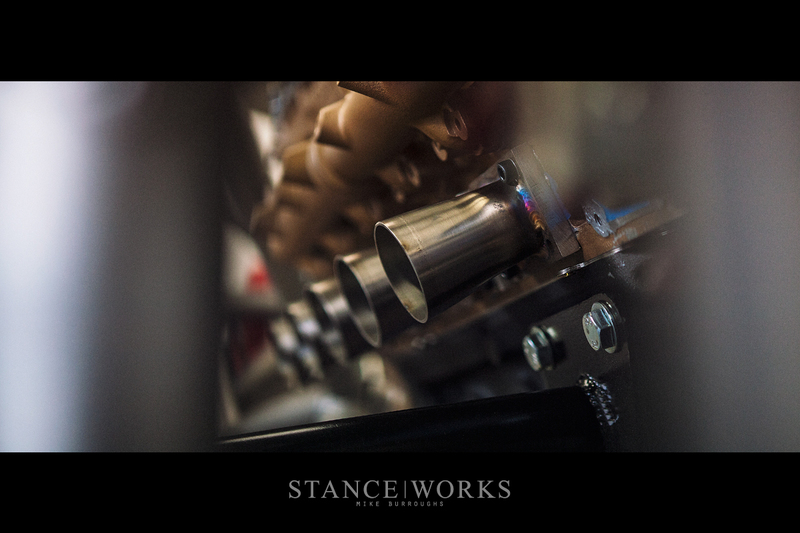 The pressure was building as the weeks closed in on our deadline for SEMA. The list of things to finish on Rusty seemed to grow longer by the day, with several major tasks still miles from completion. Byron Wilcox and I had set out to build the car ourselves, solely and without help, but as time went on, other friends such as Khalil Kassem and Eric Walton spent evenings at the shop helping to see the car through to completion for its big unveil. However, despite our combined talents and our cumulative drive, there were still a few tasks beyond our capabilities. Having partnered with VAC Motorsports in Philadelphia to build the heart of Rusty, it was important to me that all aspects of the engine and its accessories were the best available. VAC pushed Rusty's S38 to its limit, meaning anything affixed that wasn't of a similar caliber was only going slow things down, both figuratively and literally. 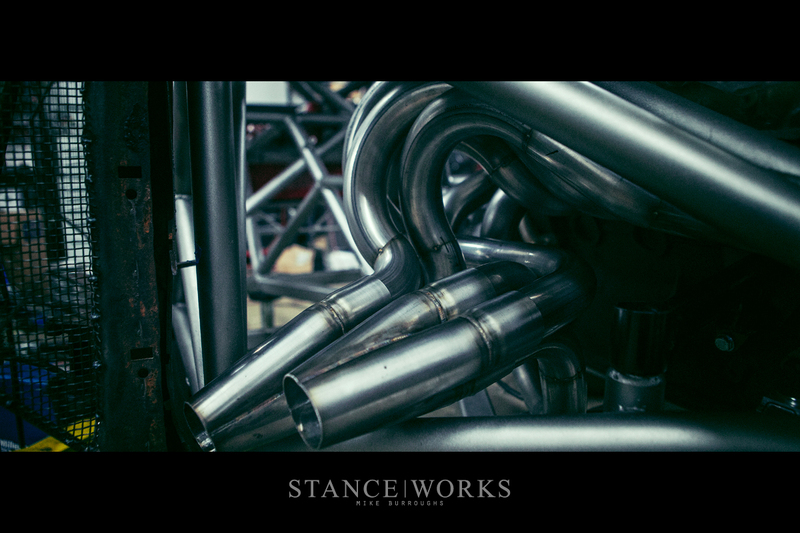 The exhaust system, from the headers back, was one of the largest remaining hurdles in finishing the car, and while a few options exists for S38 headers, nothing fit the bill for what I wanted. I knew from the get-go that I'd have to bring someone in to build the system, and finding the right person for the build offered its own challenges. I had eyed a few fabricators for the work, and spoken to a couple, but it was Eric that offered up the right answer: "Talk to my buddy Robert. He's good. I told him we're building something 'wild' and he anxious to help," he said. With that, I called Robert Chavez. His interest was piqued: I was secretive about what I was building, insisting that if he made the drive down to the shop, we could talk further about the project. The following night, Robert arrived, and I hit him with the monumental list of obstacles and headaches that lie between him and the work I was asking for. First and foremost, it was a requirement that the build remain a secret. He was welcome to share that he was working on "Rusty," but nothing more. That was perhaps the easiest request. Following that, the car had to remain at our shop, as there'd be no time to take the car anywhere else to have the work done. Robert would effectively have to move into the shop until the project was finished. Next, I outlined what exactly I was after: an equal-length bundle of snakes, latched to the motor. 6 2" primaries with 2 3-to-1 collectors, merged later into a 4" outlet through the rocker panel. A simple long-tube setup wouldn't suffice, and he understood. Lastly, I gave him a timeline: "The car has to leave for Las Vegas in just 6 days." Where most fabricators might scoff at the level of work in front of them, Robert only said with a resounding smile, "Alright, let's do it." Over the next six days, I watched as Robert chopped his way through tube after tube of 304 Stainless. 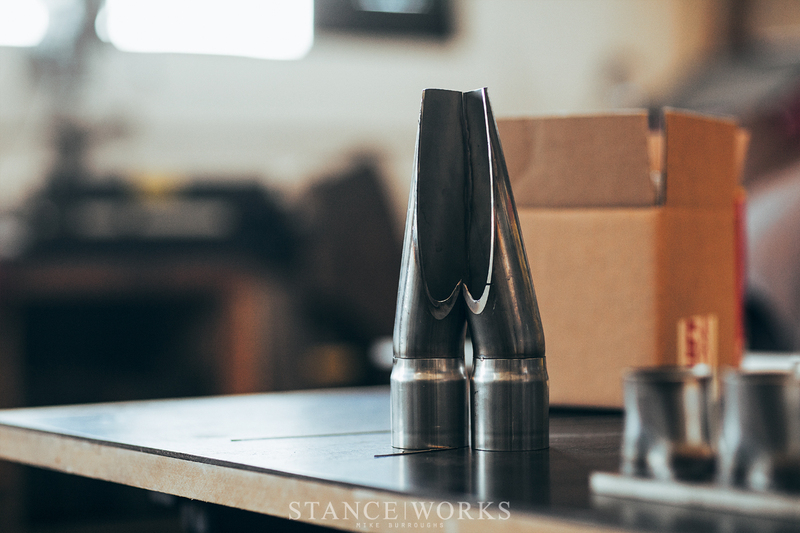 He began by making the flanges, built to mimic the factory counterparts, only port-matched to the head. From there, he custom-shaped the mouth of the primaries, formed to match the hourglass-esqe ports precisely. It was abundantly clear that Robert knew what he was doing, and it proved hard not to stop and watch him work his magic - there was still work to be done on my part. I expected Robert to use some off-the-shelf parts to make his job a bit easier, but instead, he opted to fabricate everything, including the two 3-to-1 collectors and the remaining 2-to-1, from scratch. The process, for the uninitiated, involves merging 3 pipes into one, using precise cross-sectional cuts to mate the surfaces. 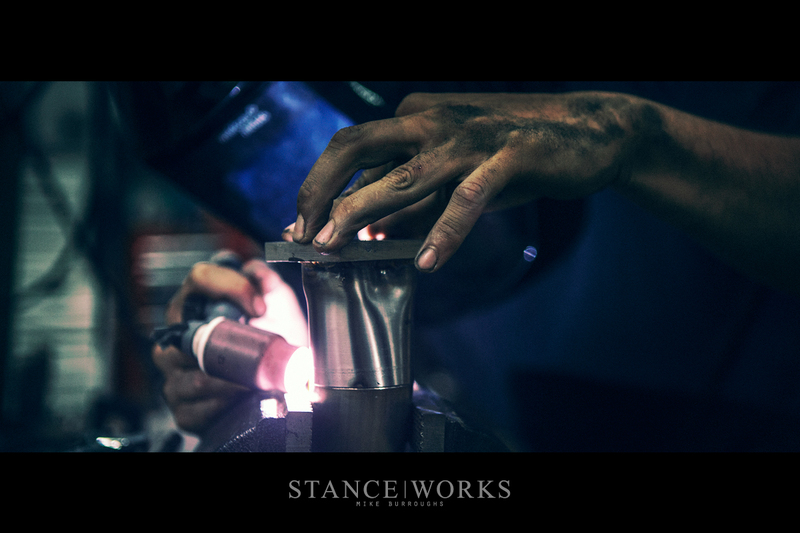 After a day of some crafty welding, Robert had nearly every piece needed to build the exhaust, and moved on to routing the primaries. Robert and I looked to a number of classic race cars for inspiration on how and where to route each tube, how their paths should interact, and what made the best use of our available space. We both agreed: passenger foot room be damned, there's nothing cooler than a truly spectacular header. At just 24 years old, Robert's talents surpass his years, leading me to ask about his automotive roots as we worked through the week. 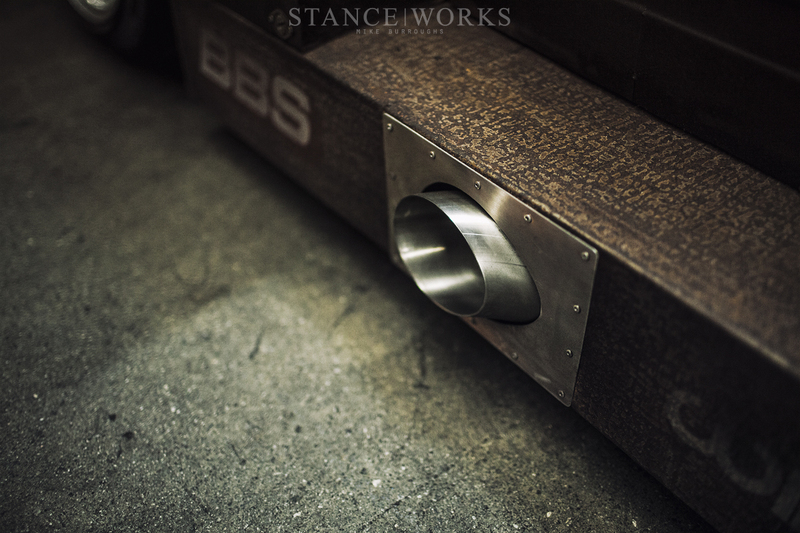 Robert's origins are in the world of mini trucks, where at 17, he picked up a welder and built his first ride. The suspension and chassis work involved in the world of slammed trucks dwarfs the effort it takes to slam most cars, but Robert's the kind of guy to dive in head first, and its clear his commitment at a young age has paid off. After mastering MIG, he moved on to TIG welding, known for its significantly steeper learning curve; however, where most struggle, Robert was a natural. 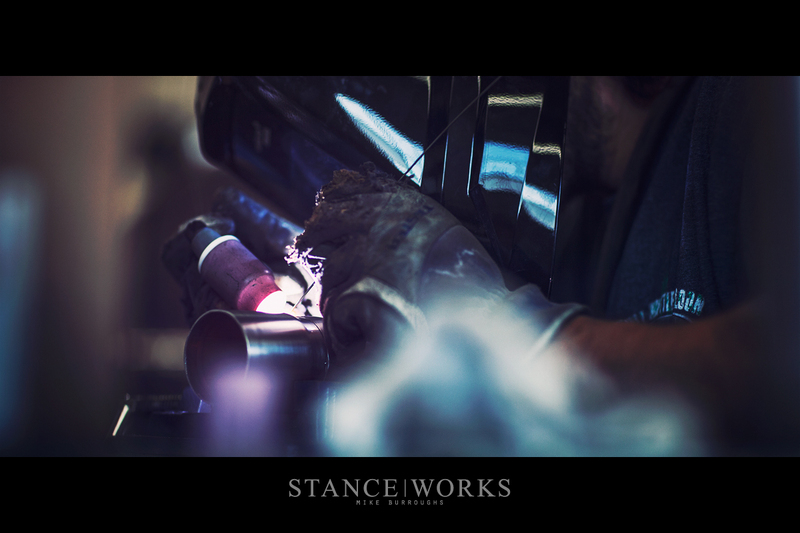 His talents lead him to live the fabricator's dream, working for no one in particular, "freelancing" his talents out to shops throughout Southern California. The concept of a "9 to 5" is a distant thought, instead tackling projects that pique his excitement and interest. Luckily for me, Rusty fit the bill, and the product of Robert's work on Rusty may very well be one of my favorite pieces on the car. 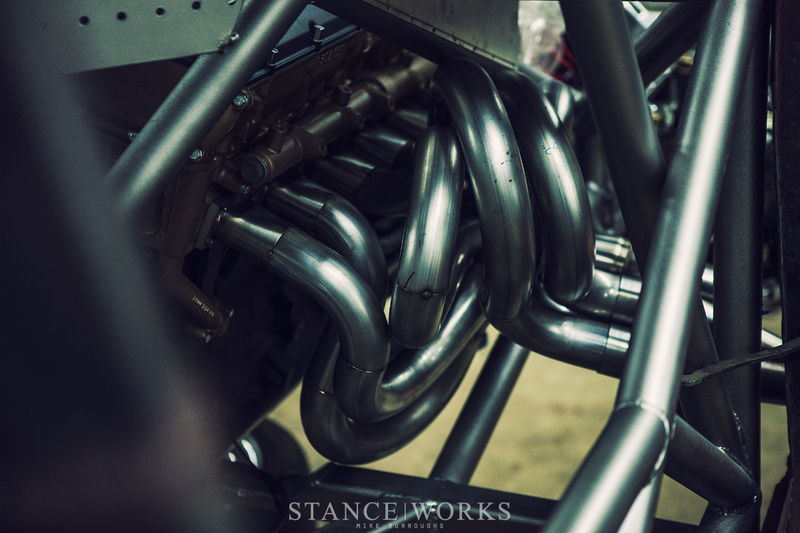 While it's easy to fall in love with more stand-out pieces, such as the wheels or the engine as a whole, Robert Chavez's headers blend craftsmanship, design, art, and talent into a piece that is entirely unique and one-of-a-kind. Through late nights and early mornings, and even a 72-hour-straight stint at the end, Robert saw to it that Rusty was ready for SEMA. His hard work, his attitude, and most importantly, his tremendous talent, have earned a friend and customer for life. 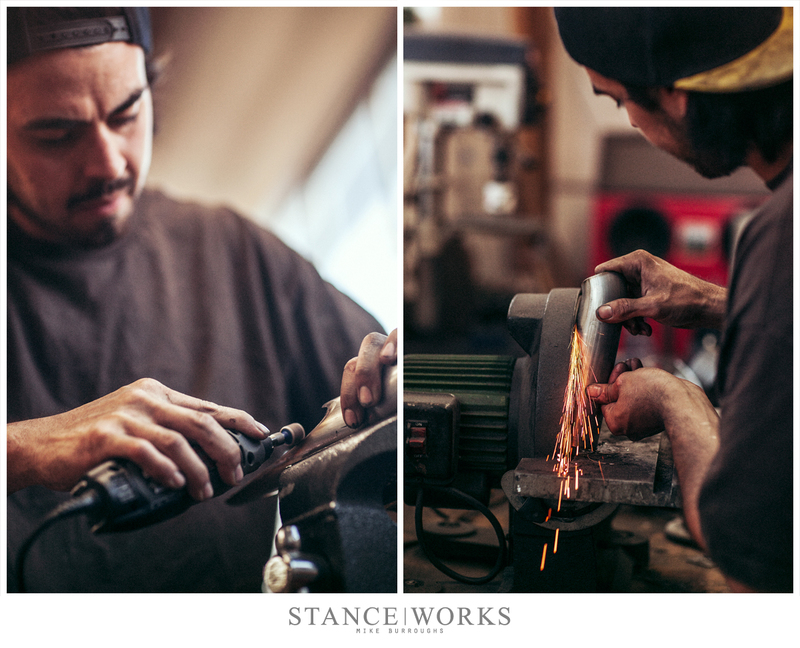 For anyone in Southern California in need of fabrication, from mild to wild, Robert Chavez is the man to call. 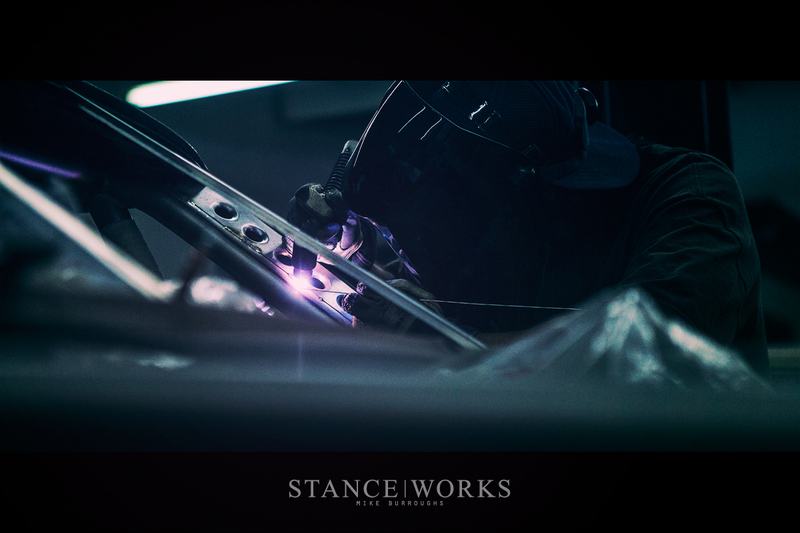 For the rest of the country, you'll just have to wait and see what StanceWorks and Robert cook up next. I always respect that hands. Is there any way to contact him?